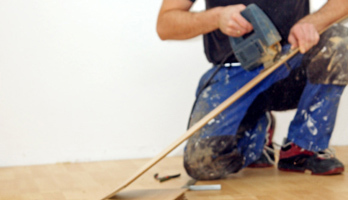 KUECHLER services do not stop after the move is completed – our all-round handyman support services are also available. If you are moving with your made-to-measure fitted kitchen, alterations or completions can be necessary in order to put it into your new home. Our kitchen carpenters will be glad to fulfil this task for you. Our membership of different networks makes it possible for us to offer this service in Germany, Europe and all over the world. We can also organize the transport of your new countertop and work surface. Ceiling lights, TV sets, satellite units, cookers – our electrician or our network partners-electricians will be glad to connect those and many other devices for you. Our plumber or one of our network partners-plumbers will connect your washing machine or dishwasher as well as installing your new heating system and put it into service. If you would like to give your house or apartment a finishing touch by having it thoroughly cleaned before it is sold or handed over, we would be happy to organize this for you. If painting works are necessary after you have moved out or before you move in, we can also provide you with specialists in this field from our network. A move is always a good opportunity to sort things out. In case you would like to part from old furniture etc., we can take them to the disposal grounds for you. We can dispose your outdated files and data material on mediums like CDs, DVDs, microfilms etc. In doing so, we guarantee shredding or incineration according to the requirements of the Bundesdatenschutzgesetz (German data protection act) including the required proof of destruction.